Consuming music has been my primary pop culture obsession for more than 20 years. At this point in my music listening lifetime, I find myself quickly forming opinions—often quite firm ones—on musical acts soon after I first hear them. I’d like to think that’s a natural human process of filtering and prioritizing stimuli, so that we don’t futilely attempt to attend equally to all the sensory input we encounter. And besides, in this unprecedented era of cheap, easy access to great music and in the midst of a dizzying proliferation of diverse talent, it’s easy to get lost no matter how much we filter, unless we just stop paying attention altogether. However, one unfortunate but inevitable outcome of this process, of course, is that we could end up missing great music by established artists just because we’ve made judgments based on earlier songs or albums. So it goes for me with the newest albums by the Decemberists and Josh Ritter, two acts whom I would have claimed not to like at all if you’d asked me just a few months ago. After recent exposure to the Decemberists’ The King is Dead (Capitol, 2011) and Josh Ritter’s So Runs the World Away (Pytheas/Redeye, 2010)—both stunning, beautiful artistic statements—I’m happy to admit that I was wrong to write off these folks based on prior stuff I’d heard. If you’re a fan of either or both, I’d welcome your suggestions for other Josh Ritter or Decemberists songs/albums I should check out. Leave comments below if you’re so inclined. I’m still not sure I’ll be able to get into a lot of the Decemberists’ earlier stuff—I’ve found them pretty damn cloying for a long time—but I’m willing to give it a shot. As for Josh Ritter, I’m pretty ignorant and will welcome any and all suggestions. Sadly, I think I made my mind up about him just because of who he’s usually grouped with, the “sensitive coffeehouse” set, which I usually don’t care for at all. 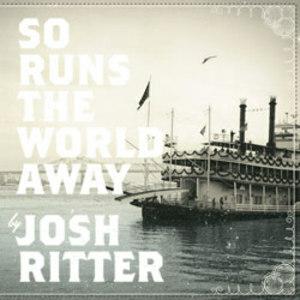 At least when it comes to the Josh Ritter I hear on So Runs the World Away, I was very wrong indeed. He’s much more than a fragile boy with an acoustic guitar and a tender heart. I basically love every song on both albums, but here are a few notes on several tracks that particularly stand out for me. “Long Shadows”—I’m here writing this post today because I randomly heard this track on the radio, loved it instantly, and bought the album a few days later. I love this song’s looping wordplay, where the end of some lines informs the beginning of the next, and how Ritter stretches out the “o” sound in the word “long,” so that the “looooong shadows” actually do stretch out across the song. The guitars and singing are lovely. And finally, like all great, timeless love songs, “Long Shadows” is simple and accessible and universal while still conveying intimacy and a unique personal perspective. “Rattling Locks”—This isn’t one of my absolute favorites on the record, but for me it did the most (along with the odd, clanging “The Remnant”) to destroy the notion that Ritter is just another neo-folkie singer/songwriter. Add a few thousand cigarettes and a load of gravel, and “Rattling Locks” could almost pass for a later Tom Waits track. Even with the smoothed edges relative to Waits, Josh Ritter positively spits some of these lyrics, and the guitars are sufficiently gnarly to make you know this ain’t no folk song. “Lantern”—Bruce Springsteen and every other credible American arena rocker of the last 30 years, and especially their modern pseudo-indie acolytes such as Arcade Fire, could and should take a cue from this triumphant anthem. Go read the lyrics, and I think you may agree that this is pure everyman poetry brilliance—all open windows on a country road, best girl in the passenger seat, put today’s cares away, laugh in spite of everything, and keep trying to build and engage and love in a world that makes nothing positive easy. The music and melodies are just as celebratory and straightforward and inspiring as the thematic content. The repetitive coda, again with nice looping wordplay, is a plea and a promise to build a lasting, mutually supportive love, and it’s moving as hell. “Rox in the Box”—A funny, catchy song about how the hard labor of life only stops when you die; a fatalistic ditty drenched in an entire century of American folk and blues musical traditions. Who else among our current crop of “indie-rock elites” would be audacious enough to try that, let alone pull it off? “January Hymn” and “June Hymn”—I’m really not a good enough writer to describe the evocative power of these twin hymns. Both are quite cinematic, with rich visual detail in the lyrics, an air of wistful reflection and remembrance, and an abundance of lovely musical flourishes. “Don’t Carry it All”—It’s easy to point to “Calamity Song” and a couple of others as the ones that most obviously mark The King is Dead as the Decemberists’ “R.E.M. album.” You know, the ones that sound like Peter Buck is playing with the band because Peter Buck is, in fact, playing with the band. But for me, “Don’t Carry it All” is also reminiscent of R.E.M. (on classics such as “Find the River,” one of my all-time favorites) in that its lyrics actually contain wisdom for how to make it through the world, and live well, alongside your fellow human beings. I also love the seasonal, naturalist bent of the lyrics, which also crops up in nearly every song on the album. ← The Best News You’ll Hear All Week: Is There a Wet Hot American Summer Prequel on the Way? I adore the early Decemberists stuff. I’ve never found it particularly cloying, though I do think with some time the band’s distinct personality really grows on you. 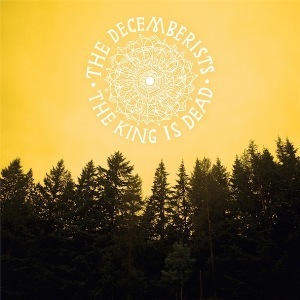 For what it’s worth, from the early Decemberists catalogue I’d recommend Her Majesty (love the song “Los Angeles, I’m Yours”) or Picaresque (though that’s more mid- than early-Decemberists, and a really sound, cohesive album). I also recommend wearing a crumpled top hat as you listen to anything by them. Just because.